As at the end of July, 2015, the total installed capacity of solar water heating systems is estimated to be 1018.48kWth (1454.97 m2). During the market survey, the capacity captured was 725.9 kWth. Table 14 shows the various categories that make up the capacity captured. The difference between the estimated and captured capacities (292.58 kWth) was based on the information from the installers that were not captured during the survey. 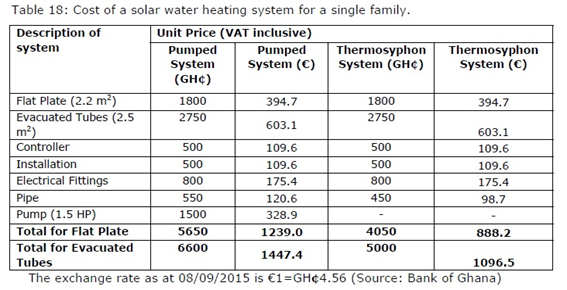 The cost of solar water heating systems and components in Ghana varies depending on the country of origin and the company that manufactured it. The price also depends on the type of system that has been installed i.e. direct or indirect and thermo siphon or pumped systems. Some cost information and analysis has been given below. Assuming a medium hot water demand of 50l per day, a single-family size of 4 people will demand 200l of hot water daily. The average price for a 200l cost for such system is shown in Table 18. To support and promote Renewable Energy (RE) security in the country, the Government of Ghana (GoG) through an Act of Parliament enacted the RE Act, 2011 (Act 832). The object of the Act is to provide for the development, management, utilisation, sustainability and adequate supply of renewable energy for the generation of heat and power and for other related matters in an efficient and environmentally friendly manner. The Ministry of Energy is mandated to provide policy direction for the achievement of the objectives of the Act. To execute the work packages necessary in fulfilment of the objectives of the Act, the roles of some key related agencies are discussed. Public Utilities and Regulation Commission (PURC): Economic regulation and setting tariffs for electricity including the RE Feed-in-Tariff. Environmental Protection Agency (EPA): Environmental regulation and permitting. Ghana Investment Promotion Centre (GIPC): Assist and facilitate incentives for private sector investments. Ghana Investment Promotion Council Act 2013 (Act 865); provides tax incentives for investments located outside industrialized centres. Value Added Tax 2013, (Act 870); this provides exemption for RE energy equipment imported in parts into the country. Feed-in-tariff scheme under which electricity generated from RE sources would be offered a guaranteed price. Purchase obligation under which power distribution utilities and bulk electricity consumers will be obliged to purchase a certain percentage of their energy required from electricity generated from RE sources. Net Metering (distributed generation) under which RE generated on site may be delivered to the local utility to offset the cost of electricity provided by the utility. Off-grid Electrification aims at promoting mini-grid and stand-alone RE systems for remote off-grid systems.